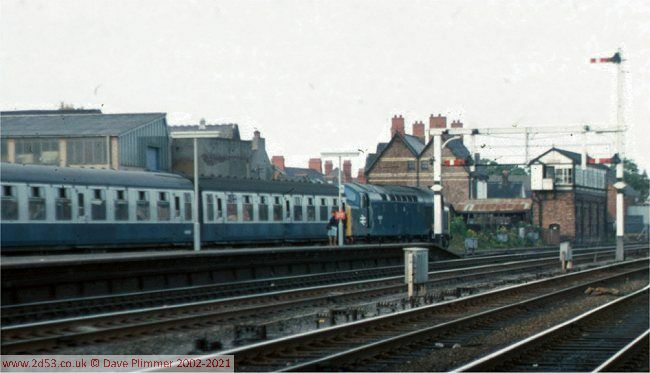 Although not the biggest or busiest station on the Noth Wales coast line, in the 1970s, Rhyl was the only station to retain two signal boxes. 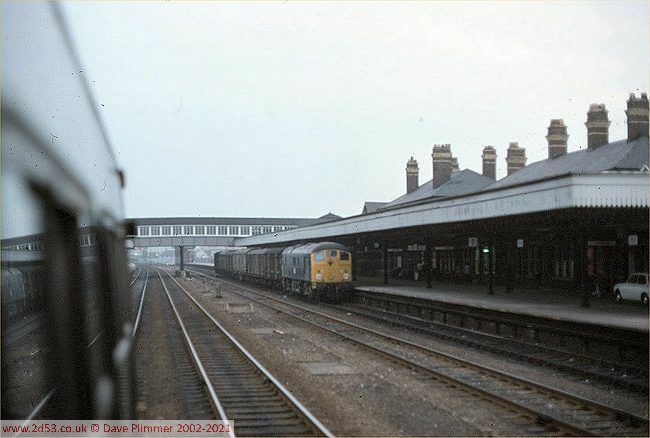 It also had three through platforms, a bay platform, two centre through roads, carriage sidings and a large goods yard. It also retained a large number of semaphore signals. Despite all these attractions, my collection of photographs taken at Rhyl is very disappointing, especially as many of them seem to be of the 'loco in close-up' variety which could have been taken anywhere!. Some indication of what I missed, is seen in the timetable extract at the bottom of the page - westbound arrivals and departures for summer Saturdays in 1976. 47187 rolls into Platform 1 at Rhyl with an unidentified excursion or relief train on the 24th July 1976. It carries a headcode of 1P72 on paper letters stuck to the cab window. In the background is Rhyl No 2 box, which controlled the west end of the station layout. As the train seen above waits in Platform 1, 40115 arrives in the down platform with a westbound train. 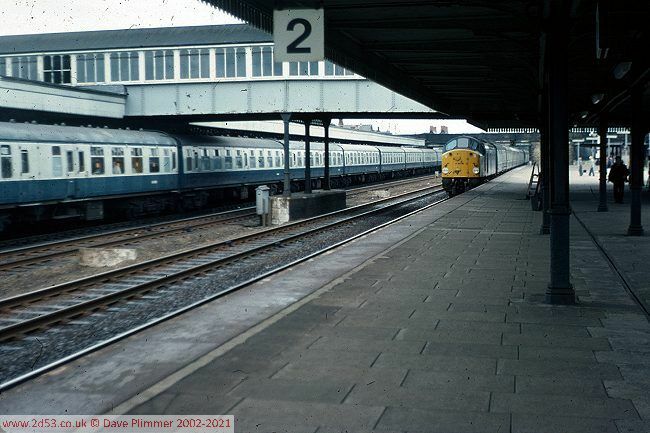 This platform had tracks on both sides, although Platform 3 (to the right) only had booked traffic on Summer Saturdays when a couple of trains terminated at Rhyl. (see the timetable below). 24th July 1976. 40001 stands in the bay platform 1a at Rhyl with a relief or excursion train on the 27th July 1976. Notable is the underslung starter signal for the up loop, and the repeater signal for the up through line. Just visible in this picture is the cross beam that connected the two posts. Hung from this was the post for another underslung signal, which had once controlled access from the up through to up slow. On the left hand post, the lamp for the up loop to up slow signal is still present. Beyond is Rhyl No 1 signal box. For a number of years this box closed overnight, which meant that all down trains stopping at Rhyl after 10pm had to use the Down Slow line from Prestatyn. This arrangement was in the WTT from May 1977 to May 1985. On the same evening, 25054 passes on 7T46, the freight working from Amlwch to Mold Junction, on this occasion conveying traffic picked up intermediately. The loco shows a variation on the '0000' headcode - four dots. 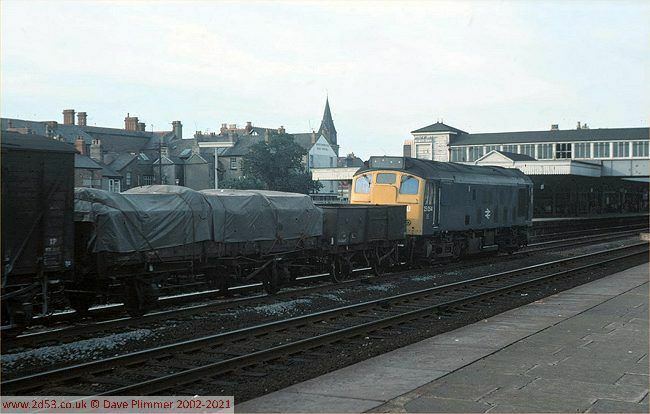 24082 sits in platform 1 at Rhyl with the 17:55 Bangor-Crewe Parcels on the 12th July 1977. 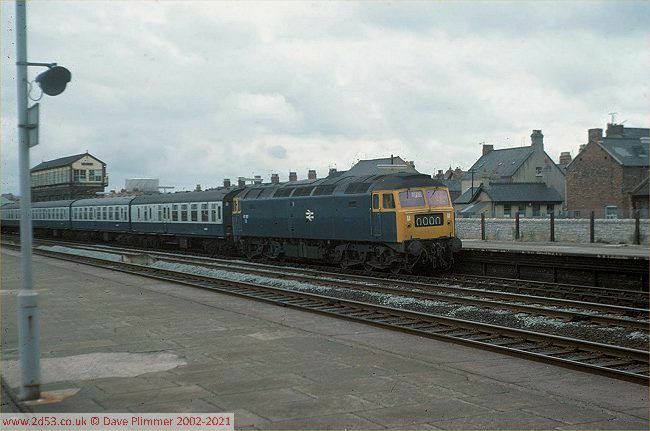 This train called at Rhyl and Chester, the Colwyn Bay stop having been removed earlier that year. The train is formed of the usual variety of vans, some of which travelled on to further destinations beyond Crewe. Interestingly, this train does not appear in the Working Timetables for 1977-78 or 1978-79. It continued to run until October 1978, and then briefly at Christmas 1978 and 1979. DMU. Runs Slow Line from Prestatyn. Works 11:00 ECS to Chester. Runs Slow Line from Prestatyn.